When it first comes to painting chipped armour, most of us simply use our brush and "stipple" the effect around the edges of the armour plates. There's nothing wrong with this, but eventually you begin looking around to see what else is out there that you can use to get a real nice effect. The brush works, but only so well. And then you hear about sponges. 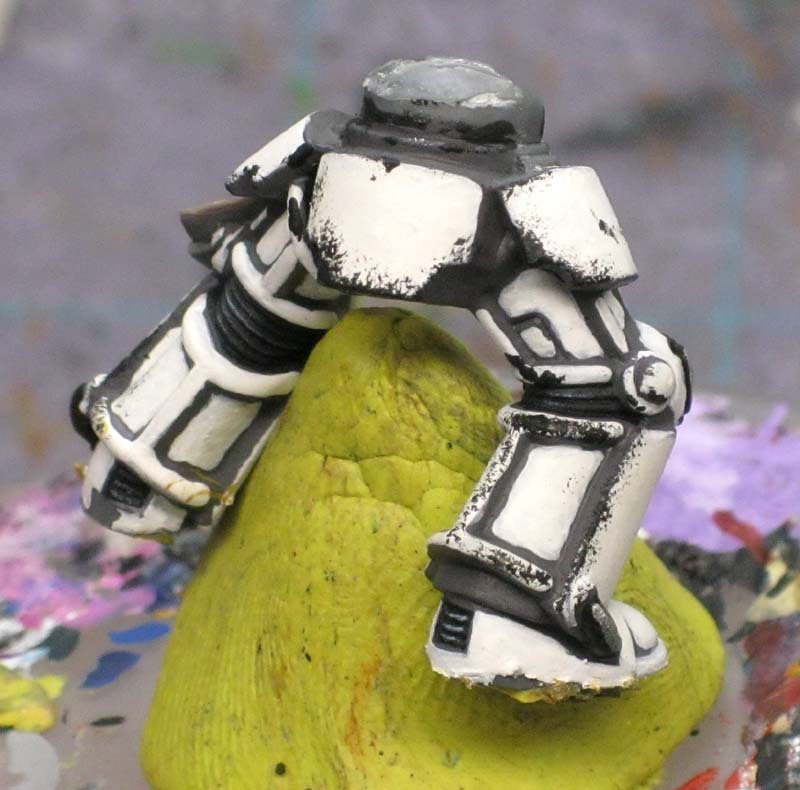 Well, you you probably find something close to that where someone has loaded up a "sponge" with paint, dabbed some of the excess away and then goes out dabbing the edges of their model's armour plates to get a great effect. And it looks much better than a brush. This guy here was done with a brush and you can get some real nice effects if you take your time. No doubt about it, but you're still limited in the finer textures you can achieve. So what kind of sponge should you use? First, let me back up to the paintbrush. There is nothing wrong with using this guy if you're careful in how you apply your paint. Keep it to the edges and don't press too hard when using the tip in other areas (to minimize damge to your brush). In fact, I still use a brush with a super fine tip to add the metallic spots to my weathering where it has "chipped away" enough paint on the model. So don't give up on the brush completely just yet. I started looking at what I was using to get my effects and I've got three things I use now. Each has it's place if you will depending on what you're "weathering." I'm going to stick to infantry models for this discussion. Left to right, we have the regular household sponge, a makeup applicator and a sea sponge. The makeup applicator is the new one for me. Most of the time, I've used the regular household sponge fairly well. But now that I have this new little guy, things have changed. So how does each one do? For me, each one has it's good and bad. Let's look at the three types I listed above. This guy has been my workhorse to date. Tear off a little piece, load it up with paint, get rid of the excess and go to work. It's good for getting a wide variety of texture. One drawback is the scale. It tends to be a bit larger than the damage would be on the model. Sometimes it can be tough to control this guy too in that even the smallest piece of sponge still covers more area than you want on the model and you have to go behind and do some cleanup work. I had to do some cleanup on the Deathwing model there. Not much, but it can be a pain if you've blended the underlying surface already. My new favorite toy. This guy is small and the scale of the damage is more appropriate for infantry models. The small applicator head is perfect for getting in there and putting the damage right where you want it with little to no clean up work. The drawback to this guy is that the paint dries fast in the applicator and you need to work quick. Cover a small area and then rinse out your tool so the paint doesn't dry inside and kill the texture. This one was a bit of a disappointment for me. The texture was all wrong for my liking and I couldn't get a piece small enough to do what I wanted despite cutting it into little chunks. At best, I might use this for weathering vehicles, but I'd be more inclined to grab my household sponge first. This guy is going in the trash at this point and I'm out the dollar I spent on him. I gave it a go with the makeup applicator on some of the armour plates on this guy. More than anything else, I was trying to get a feel for using it. I really like the scale of the damage as it's much smaller than it's two counterparts. I think with a little work, I'll be able to control my application and get just the results I want and achieve a nice scale effect on the model too. It may come down to a combination of the two tools, the makeup applicator for finer surface damage and the sponge in a few key areas for the heavy chipping and damage. Hi Ron, good to see FTW back, although with following you at BDB its almost like you never left! Anyway, what do you think would make a good "under colour" for battle damaged DA green marines? I tried a dark brown but it just looked dirty, so maybe a dark gray/unpolished ceramite style? 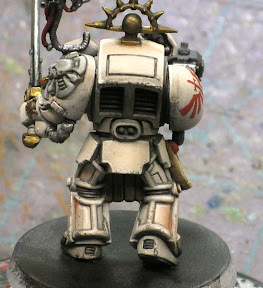 combat apothecary: I'd try maybe a dark grey or dark metallic color. Both could be "highlighted" with a brighter silver to show areas that have been worn away more recently. The trick is finding an "under color" that is not much lighter than the final armour color. 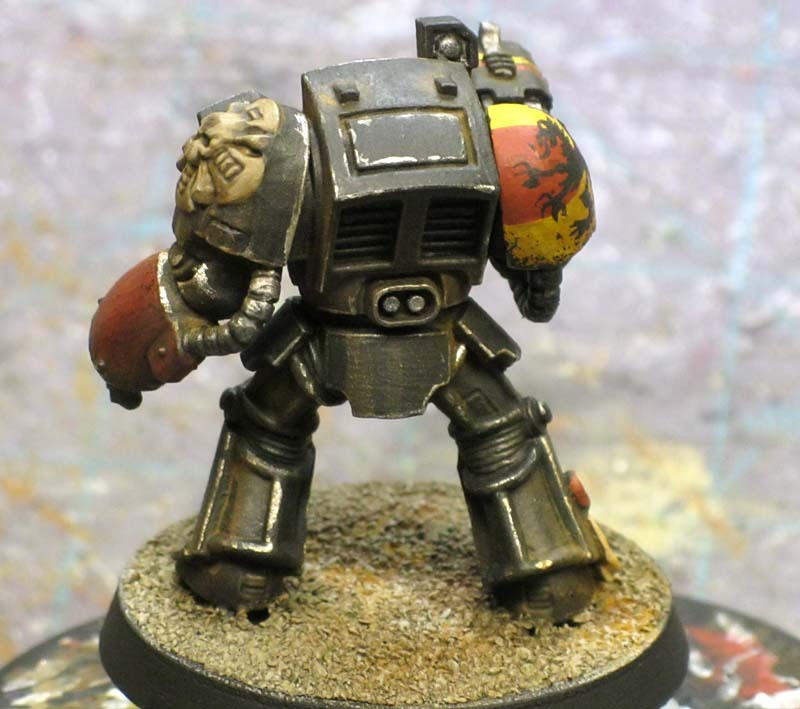 That way it doesn't appear as or get mistaken for a highlight and not battle damage. 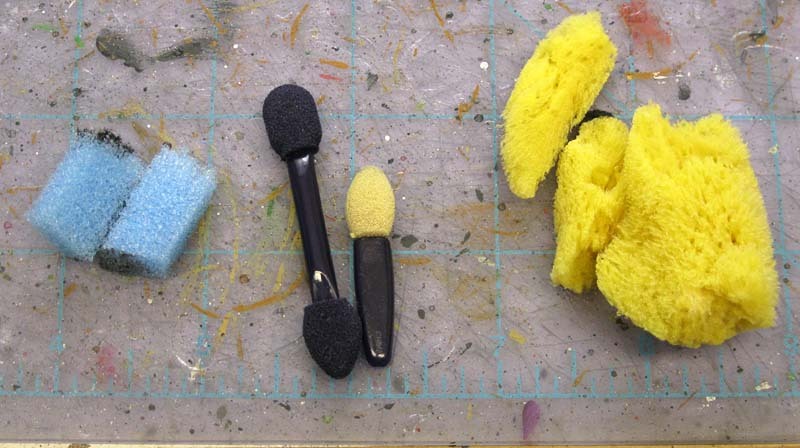 Interesting- I've been using a household sponge, same as you, up until now- I'm going to have try the mascara brush. Btw- what do you think to the technique of emphasising the damage by highlighting the edge, as seen here : http://space-wolves-grey.blogspot.com/2009/11/painting-space-wolves.html and here : http://thepaintingcorps.blogspot.com/2008/12/friday-quick-tip-sponge-painting-battle.html ? Tenzing: I've used that approach too. I think it adds a nice effect and gives the chipped paint a bit of dimensional realism. It makes it look as though the chips are "deeper" than usual. 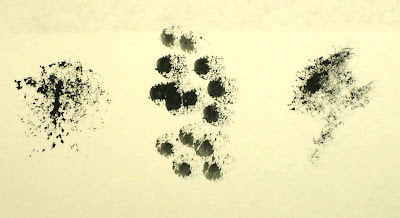 I tend to reserve this effect for things like gouges and scratches across armour to show they cut deep into it. I tend to keep my chipped paint superficial since paint is not that thick to begin with. It all comes down to the look you like best and what you're trying to convey. You can't go wrong having both in your pocket and using them as you see fit. Never would of consider the make up brush... the effect looks great on armour edges. Do you pull bits off the brush sponge? Or do you use it undamaged? Used it as is. The handle is the best part of the whole thing... make sit easy to apply. Like I mentioned, I'm going to use this guy for slight surface wear and tear and then maybe the bigger sponge for the deeper damage. That means loading the makeup brush with the "primer color" the servitors used on the armour so that when I do this, it looks like scuff marks and regular use. Then go in with the regular sponge and add my metallic color to indicate the deeper, not so frequent damage that occurs. This might sound like a dumb question, but exactly how do you apply the color? I take it that you first load up on color, wipe most of it off, but then how do you apply it? Do you dot it on? Brush it over the edges? Am I completely lost here? Asking because I'm thinking of trying this very technique out on one of my rhinos. 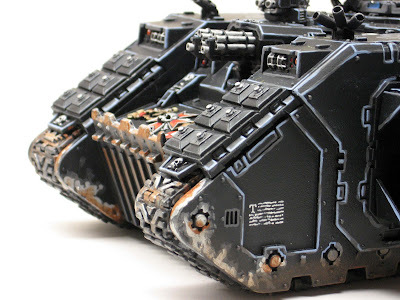 I painted the damage on my Land Raider so I wanted to see if it ends up being different and if so better or worse. Flekkzo: Nope, not a dumb question. I apply it the same way I would if I were using a chunk of any other sponge. I get some paint on it, remove the excess paint until I get the right amount and then "dab" it on the edges of the model gently. I increase the pressure f my application until I have the desired effect. Hate to hear you gave up on the yellow scheme though. @Ron Not giving up on the yellow, nor the Imperial Fists, just giving up on exactly matching it all the time :) I end up either getting better or simply trying a different way to paint yellow so that I don't get a completely coherent look in the end. It is really hard to reproduce some of the variations I've tried :) So I am hoping that my Wolves can be a coherent neat army where all armor looks the same. Ah... I see now. Your army reflects your painting ability over time and you keep getting better and better to the point where you don't like some of your earlier work now. I don't think some variety in the force will make a difference will it? If anything, it will give the army some character. You've got a consistent theme and basing right? I'm sure the army looks cohesive so it wouldn't bother me to see squads painted slightly different in the end. @Ron It's not that I don't like it, it's more that it doesn't look the same. Different shades of yellow, some brighter, some darker, different shading, highlighting, etc. And it's the same with the basing. I've got rock/grass ones, the black dead planet looking ones. There is no overarching theme. It is a typical first army :) And I was fighting this for a long time, until I understood that I would enjoy the hobby more if I gave in and did things I enjoy instead. So I will try different basing, different techniques, use the airbrush in different ways, hopefully learn new things such as proper blending etc. And I will all enjoy doing it. The army still looks like "Imperial Fists", there is no denying that. But it surely wouldn't stand a chance getting a great painting score because it doesn't have a cohesive feel to it. Well at least you've been able to learn with this army. Just think how smooth looking your next force will be. Instead of sponges I like to use foam now, from blisters or from miniature foam transport trays. The texture is much smaller than a regular sponge and I don't have to wash it regurlarly, just use a new piece. There are different textures of foam so I had to experiment a bit. Now I use those from my Felderr army bag. To apply it I cut a small piece of foam that I stick into the transparent plastic cap used to protect brushes. I leave the cap on the brush, this allows me to use it as I would a brush. Icareane: excellent stuff, thanks for sharing. I would have never thought to glue the sponge to something to hold onto. Actually you don't need to glue it. Usually there is a transparent plastic open cylinder sold with brushes to protect the hairs. You just need to stick the small bit of foam into it. Even better, I have some of them lying on my desk. Perfect! I so need to get some sponges and try these out. My goal for next week methinks. Megapope: Make sure you share your results, I'd love to see how it turns out. I use sponges somewhat less now as they contribute to my heavy handedness and I need to make sure I don't overdo it. Fred: Thanks for the links, the pics really help. Great idea adding the brown to the mix.